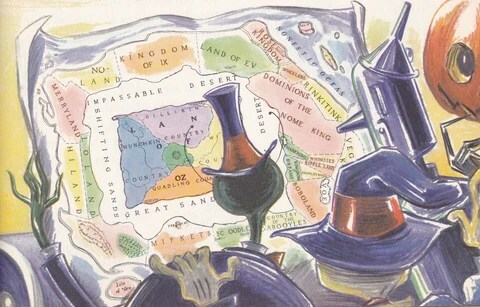 Anyone who’s read the Oz books from The Emerald City of Oz on knows that residence in that fairyland grants certain magical effects, including a lack of aging unless you want to grow older, and presumably the inability to die except through total destruction. In Tik-Tok, Private Files assures his officers that, even if an Ozite is torn into pieces, each piece would technically still be alive. In Magic tells us that “it is doubtful whether those who come to Oz from the outside world…will live forever or cannot be injured. Even Ozma is not sure about this.” By the next book, however, Glinda is sure that Dorothy will remain alive and free from pain even if she’s cut into pieces. And Bucky Jones does survive being buried in a blizzard of talcum powder. It seems to be the general rule that those who came to Oz from elsewhere are only affected by this magic so long as they stay within its borders, while those who are born there retain them elsewhere, but even this might have its exceptions. Going back to Tik-Tok, Queen Ann Soforth seems certain that she can’t die even while in Ev, while the Shaggy Man, despite being a citizen of Oz, might be killed while there. We never really find out whether she’s right, fortunately for Shaggy. When Dorothy absent-mindedly wishes herself to the United States in Lost King, she grows to the age she would have been if she hadn’t settled in Oz, although the effect isn’t immediate. It’s also reversed by her wish to be back, which not only returns her to Oz but restores her former age. I guess we don’t know if she would have remained an adult in Oz if she’d phrased the wish differently. It’s the Wizard of Oz who explains this, and according to apocryphal sources, maybe he knows this from experience. In Witch Queen, the Wizard and Glinda visit the States to obtain some herbs, and neither of them can work any magic until they reach the magic barrier around Oz in a balloon. It doesn’t say that the Wizard ages at all while there, but perhaps he does, or he took precautions against it. Christopher Buckley’s Beach Blanket BabylOz has the Wizard accidentally transport himself, Ozma, Dorothy, Toto, Trot, Scraps, and the Scarecrow to California. Once there, the Wizard, Dorothy, Toto, and Trot all begin to age; and the two magical constructs become inanimate. Ozma is able to use her magic to restore everybody, although it takes a lot of her energy to do so. George Van Buren’s Zimbo and the Magic Amulet mentions that anyone from fairyland who is over one hundred years of age will die within a half hour if they enter the Outside World, although there are likely exceptions to this rule. Jeremy Steadman’s Emerald Ring gives a name to this sudden aging, the Urbof Effect, after Torrian magician Farmooth Urbof. It does seem like this only happens when someone visits a non-fairyland, and not another fairyland where death is still possible. The Wizard explains in Paul Dana’s Magic Umbrella that Button-Bright and Ojo will age when visiting Ev, but only at a normal rate from their current age, not all at once. I’ve already looked at how magic often doesn’t work in the Outside World, but there have been exceptions since quite early on in the series. At best, I think we can say it’s uncertain whether any particular magic will work outside fairyland. When several magically animated Ozites visit America in the Queer Visitors stories, they not only remain alive, but have access to magic they never do while in Oz. It’s possible that someone gave this extra magic to them, and maybe also provided protection to make sure they wouldn’t become inanimate. Glinda would be the most likely, since this would have been before Ozma or the Wizard had learned magic (or at least they hadn’t learned much of it). Exactly how such protection would work isn’t clear. Animals talking is also a regular part of Ozian life, and this generally applies to any mundane animal who is in Oz at the time. Even Toto, who seemed to be the exception at first, reveals in Tik-Tok that he just didn’t want to talk. Billina is able to talk as soon as she reaches Ev, but it doesn’t seem like all other chickens there can, at least as per remarks by Nanda and the Nome King. Hank the Mule doesn’t talk while in Ev or the Nome Kingdom, and Bilbil’s speech is unusual to the Nomes. It does seem that animals from Oz don’t lose their ability to talk when they enter fairylands where such a thing isn’t the norm. The talking dog in Queen Zixi of Ix is an anomaly to the army of Ix, but Kabumpo has no problem talking when he’s there in Silver Princess. On the other hand, it appears that any animal visiting Samandra is unable to talk, even ones who normally can. So is Samandra actually less magical than Ix in this one respect? As for whether Ozian animals are able to speak in non-fairylands, it’s somewhat unclear. Humpty Bumpty, the camel in Enchanted Island, claims that he was unable to understand the circus workers, so he didn’t bother trying to speak to them either. He talks to David Perry, but only after he uses a magical button to wish the camel could talk. And while I’m not sure if it’s official, Rachel Cosgrove Payes stated in her author’s notes that she received information from a talking bird who lived in Oz. When Oz loses most of the effects of the enchantment in Enchanted Apples, Billina is no longer able to talk, and the Scarecrow becomes lifeless. This entry was posted in Animals, Comics, Eric Shanower, John R. Neill, L. Frank Baum, Magic, Oz, Oz Authors, Phil Lewin, Rachel Cosgrove Payes, Ruth Plumly Thompson and tagged aging, beach blanket babyloz, bilbil, billina, christopher buckley, death, dorothy gale, ev, farmooth urbof, george van buren, glinda, glinda of oz, humpty bumpty, immortality, jeremy steadman, kabumpo, lucky bucky in oz, ozma, ozma of oz, paul dana, queen zixi of ix, queer visitors from the marvelous land of oz, rinkitink in oz, samandra, scarecrow, the emerald city of oz, the emerald ring of oz, the enchanted apples of oz, the enchanted island of oz, the lost king of oz, the magic of oz, the magic umbrella of oz, the silver princess in oz, the witch queen of oz, the yellow knight of oz, tik-tok of oz, toto, urbof effect, wizard of oz, zimbo and the magic amulet. Bookmark the permalink. I suspect you’re right about Glinda (and later Ozma and the Wizard) enchanting anyone going to the Outside World (or fairylands that still have death). Ozma explains in Beach Blanket BabylOz (which is a great book, BTW, that’s belied by its title and cover), that she’s able to extend the immortality of Oz to any of her citizens even when they’re not in Oz. This explains the numerous trips made by various Ozites to the Outside World, except that in the latter story, they’re caught off-guard, anticipating a trip to the beaches of Ev (where presumably that country is at this time deathless), but ending up in California instead. Ozma’s fast-thinking saves their lives, but it’s a close call! That same book, interestingly, also shows the limits of Ozma’s power. When Trot comes upon the murdered body of a sea lion, she petitions Ozma to bring him back to life. Ozma, however, cannot resurrect the dead, and later expresses a belief in the idea that his spirit has passed on. The Wizard refuses to use the Powder of Life on the sea lion on the grounds that doing so would bring to life a rotting corpse!